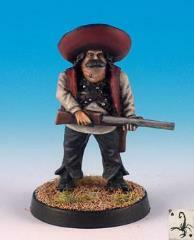 'Bobba' as his amigos call him is as renowned for his shooting skills as he is for his eating.. which is some going. He often leads a large posse of banditos, but has been known to fight for anyone for the right price. 1 piece figure supplied with base.